Preheat your oven to broil. Line a rimmed baking sheet with aluminum foil and spray with cooking spray. Generously sprinkle the chili powder mixture evenly over the tops of the salmon fillets. 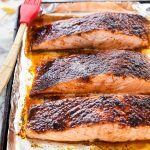 Place the salmon on the prepared baking sheet and broil for 6-9 minutes, depending on how thick your fillets are and how crispy you prefer the crust. 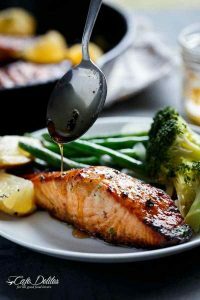 Remove the salmon from the oven and brush the maple syrup over the tops to coat the spice rub. Return to the oven and broil for an additional 1-2 minutes until the maple syrup is bubbling and has formed a crust. Serve immediately. Sear skin side for 1-2 min, flip, salt and pepper fish then add marinade. Cook for 3-4 min. Remove fish to broiler pan. First make the green goddess pesto. In the bowl of a food processor, add the basil, parsley, dill, chives, scallions, tarragon, lemon juice, salt, black pepper, and olive oil. Process until smooth, scraping down the sides of the bowl as needed. Next, rinse your salmon fillet, pat it dry with a paper towel, and season with salt. Heat two tablespoons of olive oil in a cast-iron skillet over medium-high heat. Sear the salmon until cooked through on both sides, approximately 5-6 minutes per side (depending on the thickness of the fish and your preference for doneness). 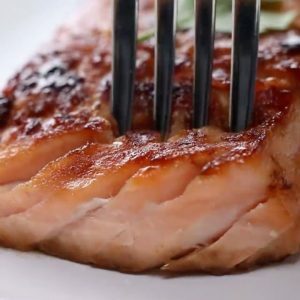 When it’s cooked to your liking, transfer to a plate, and with two forks, flake the salmon. Next, bring a pot of salted water up to a boil. Boil the pasta according to package instructions until al dente. While the pasta is cooking, heat a large skillet over medium-high heat. Add the butter and the garlic. Stir the garlic until lightly browned, and then add the capers. Turn the heat all the way down to low, and stir to combine. Add the heavy cream, followed by the peas. Stir to warm the peas through. Add the cooked pasta and stir thoroughly until the pasta is coated in the cream. Next, add the pesto and stir to combine. Top with the flaked salmon, additional black pepper to taste, and lemon zest. 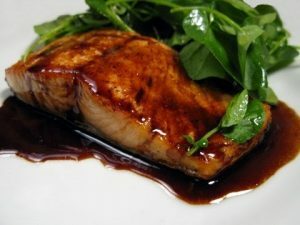 Mix first five ingredients, marinate salmon for 30 min in about 4 tbsp of mixture. cook marinade for 10-15 min until thickened, add butter. Preheat oven to 400-425,salt and pepper salmon then bake for 5 min on lowest rack, then 4-5 min on next rack. Remove from oven pour over some marinade then put back in over for 1 min. Serve.Mine salmon wasn’t broiled so the sauce did not brown the fish. In a medium bowl, combine maple syrup, bourbon, orange juice, soy sauce, garlic, cayenne, salt, and pepper. Place salmon in a shallow baking dish. Add liquid mixture to dish, submerging fillet; refrigerate and marinate for 30 minutes. Drain most of marinade from baking dish, and reserve. 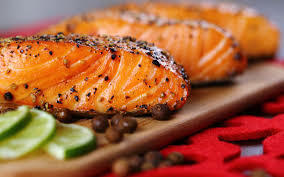 Bake salmon for 10-15 minutes (adjust cooking time depending on thickness of fillet and desired doneness). Cut the slices of bread into smaller rectangles. You can make them bite sized, if you like. Spread a very thin layer of soft butter on each slice and toast in the oven for a few minutes until they just start to get crisp. This step is optional, you can also use the bread un-toasted. Spread a little dilled mayonnaise onto each slice of bread, then top that with a slice of smoked salmon. Add microgreens, and then season with a little salt and pepper. 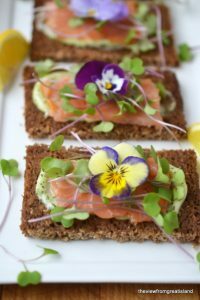 Garnish with an edible flower, and serve with small wedges of lemon. To make the homemade mayonnaise: Put the room temperature egg, oil and dill in a jar just large enough to fit an immersion blender. Put the blender down to the bottom of the jar, and turn it on, slowly raising the blade as it emulsifies the mixture. This will only take about 30 seconds. Once it turns to mayo, stop the blending. You can then stir in the salt and pepper, and a little lemon juice, if you like. 1. 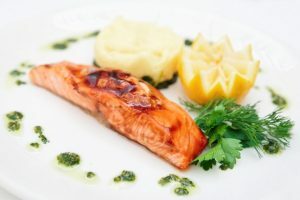 Remove the salmon from the refrigerator 30 minutes before cooking to bring it to room temperature. 2. To Make the Sauce: In a small bowl, stir together the soy sauce, vinegar, and sugar until the sugar is dissolved. Stir in the 4 green onions and julienned ginger. Set aside. 3. In a sauté pan just large enough to hold the salmon fillets in a single layer, combine the water, 3 green onions, and sliced ginger. Bring to a boil over medium heat, turn the heat to medium-low, and simmer for 5 minutes. Using a spatula, carefully slip the salmon into the pan. 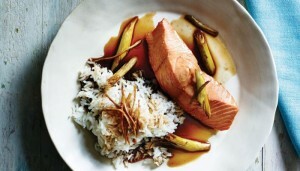 (The salmon should be completely submerged in the poaching liquid. If it isn’t, add a bit more water.) Cover the pan and poach the salmon for 5 minutes. 4. Again using the spatula, lift the salmon to a plate. Carefully drain off almost all the poaching liquid from the pan, leaving only 1/4 cup [60 ml] in the pan. Remove and discard the green onions and ginger from the pan. Return the pan to medium-low heat and add the vinegar sauce. Bring to a simmer, stirring occasionally. Slip the salmon back into the pan and baste with the sauce. 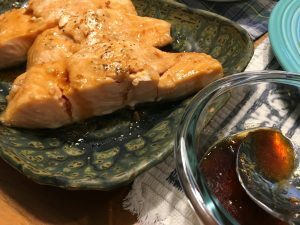 Continue to braise the salmon, basting frequently, until almost opaque throughout, or an instant-read thermometer inserted into the center registers 125°F [52°C] or a little above, about 8 minutes. The sauce will have reduced and thickened a little. 5. 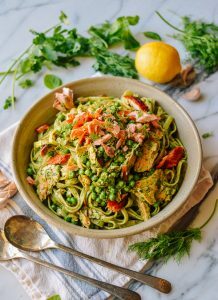 Transfer the salmon to warmed dinner plates or shallow pasta bowls. Spoon the sauce around the fillets, dividing it evenly. Serve immediately. While salmon cooks, pour marinade into sauce pan. Bring to a boil then reduce heat to low and let simmer until liquid thickens into a glaze-like consistency, about 10 minutes. Remove from heat and top salmon with glaze.